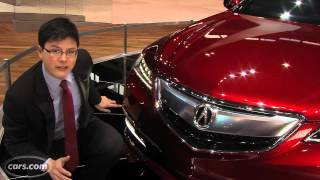 Acura has unveiled the 2015 Acura TLX Prototype at the 2014 North American International Auto Show. 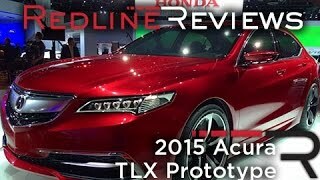 The Acura TLX Prototype showcases the design and performance direction for the all-new 2015 TLX performance-luxury sedan launching later this year. The TLX was developed around the theme "Red Carpet Athlete" to deliver a compelling blend of luxury refinement and sports-sedan athleticism. The TLX Prototype, bathed in Acura Athletic Red Pearl, presents a lithe exterior form with a prominent grille along with Jewel Eye LED headlights. Also we can see a sculpted hood, custom-designed five-spoke 20-inch alloy wheels and aerodynamic side skirts. The production model will be offered with two different engines including an all-new 2.4-liter 16-valve inline 4-cylinder engine connected to an eight-speed dual clutch transmission and a 3.5-liter SOHC V-6 paired to a nine-speed automatic. Both the 2.4-liter and 3.5-liter TLX models will target EPA fuel economy ratings at the top of the midsize luxury sedan class. Two-wheel-drive models will utilize the next generation of Acura Precision All-Wheel Steer™ (P-AWS™) technology. The 3.5-liter V6 can be outfitted with a new generation Super-Handling All Wheel Drive™ technology that has new torque-vectoring control logic. The new TLX will feature an Integrated Dynamics System (IDS) with four driving modes - ECON (Economy), Normal, Sport, and a new Sport+ mode. Depending on which mode the driver selects, the Integrated Dynamics System will adjust Electric Power Steering (EPS), throttle response, SH-AWD and P-AWS control logic, transmission shift mapping, Active Noise Control settings and HVAC control in accordance with the preferences of the driver. 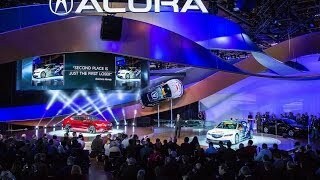 The TLX will be available with Acura's most advanced safety and driver-assistive technologies including Collision Mitigation Braking System™ (CMBS™), Forward Collision Warning (FCW), Lane Departure Warning (LDW), Lane Keeping Assist System (LKAS), Adaptive Cruise Control (ACC) with Low-Speed Follow and Blind Spot Indicator (BSI).